Ray Bradbury’s The Halloween Tree has been on my seasonal must-read pile pretty much every fall since I first purchased the Bantam paperback edition back in 1974. 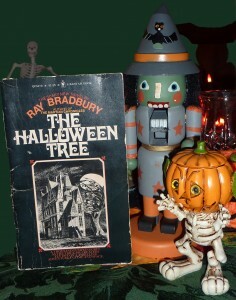 In best Bradbury form it is a classic “boy’s tale” that reveals the origins of all hallow’s eve tradition. The story originated as a screenplay in 1967 and in the land of “what is and what will never be” would have been produced by animator Chuck Jones (How The Grinch Stole Christmas) – but it was never realized. I’ve always thought it would make a superb addition to Tim Burton’s stop motion ouevre along with Corpse Bride and Nightmare Before Christmas. The Halloween Tree was animated back in the 1990’s and unfortunately messed with enough to ruin its intent but there is a nice faithful “theater of the mind” radio play version available on CD.